October saw the launch of the 2011/2012 Parliamentary Shadowing Scheme. 25 dynamic and enthusiastic BME individuals have been selected to take part in this year's programme. 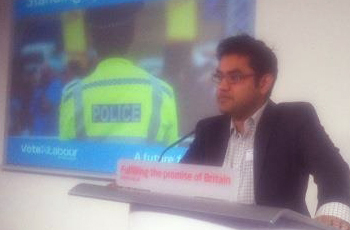 January 2012- Mohammed Ullah, Labour Shadow. Mohammed pictured here at Labour Party HQ. I am a local party activist, unusually for someone from a mathematics and computing background, I have been totally addicted to politics from a young age, and serving my community is my obsession, an unapologetic, unswerving determination to better the world. This is why I applied. The first training day for the Parliamentary Shadowing Scheme focused on the internal party selection process and media training. Both were designed to equip the Shadows with the skills and knowledge needed to stand for public office. Meanwhile, the media training, provide the Shadows with their first real opportunity behind the camera, which will no doubt stay with them forever. 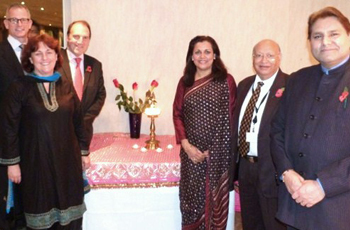 Anuja Prashar at her Diwali event with mentor Baroness Scott, Simon Hughes MP and other invited guests. Speaking at the event Anuja said that her Hindu values resonate best with Liberal Democrat core values of pluralism and Individualism. "The sense of individual responsibility and commitment to a higher purpose, which is at the heart of Hinduism, is proportionate with Liberal Democratic principles of Individualism and fairness to the whole of society." 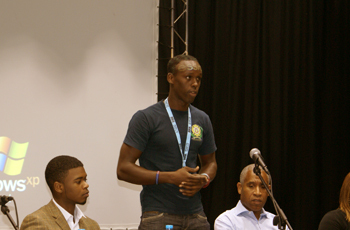 Mo Ahmed speaks at a youth empowerment event. My name is Mo Ahmed and I would like to think I am that person that gives all young people hope, I have made many mistakes in my life but i have managed to overcome all that life has thrown at me. I have done this thanks to the help of many but my determination for a better life. I am currently a firefighter based in Brighton and I also run my own fitness company. I have joint custody of my 5 year old daughter and that's the most important role job I have.